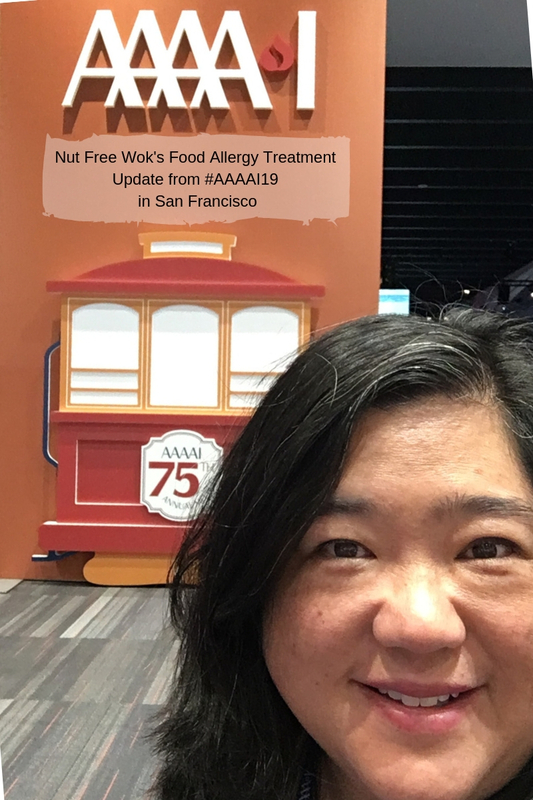 I learned a lot at #AAAAI19 about the current state of food allergy treatment research. I also listened to presentations about sesame which is now the 9th most common allergen, food allergy bullying, and psychosocial concerns of food allergies. 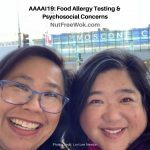 My friend Lori Lee Newton came with me also and we wrote a post together about what we heard about the psychosocial considerations of food allergies and food allergy testing. 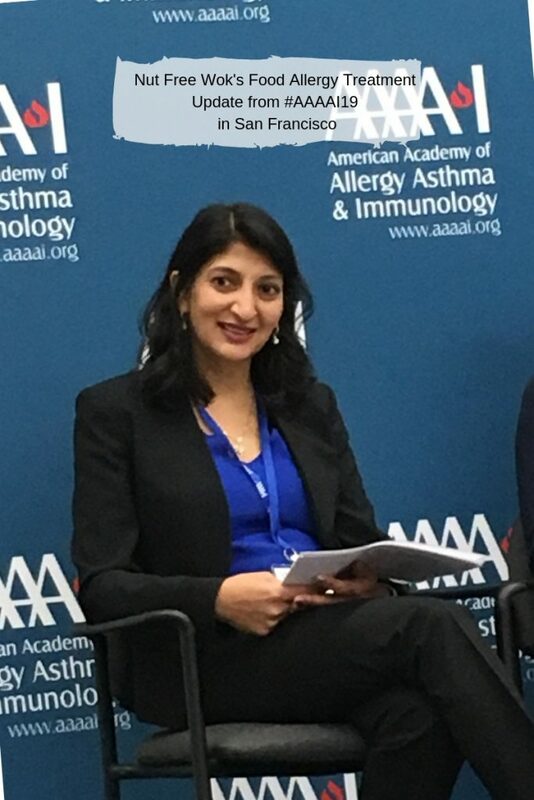 The American Academy of Allergy, Asthma and Immunology (AAAAI) hosts an annual conference for allergists and immunologists. 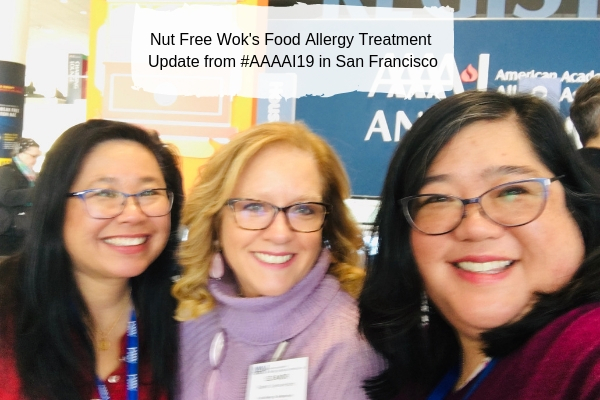 I have been following the conference on Twitter for years (you can find the related tweets by using the hashtag #AAAAI19) but attending the conference in my hometown of San Francisco was a beyond fantastic and I had a chance to see friends. Disclaimer: Please keep in mind that this post is for informational purposes only, a) I try my best to be accurate but I am not a medical professional, b) I am not sharing medical advice, please discuss with your medical care team if you have questions or concerns, and c) none of the treatments are suitable as a Do It Yourself project, you must be under the supervision of your medical care team. 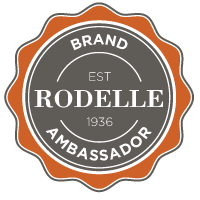 I am also disclosing that I am a moderator for Food Allergy Treatment Talk Facebook Group and a Mission Ambassador for End Allergies Together. 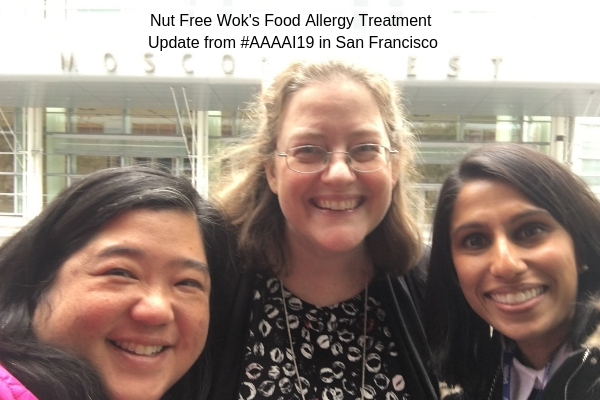 I’m so happy to be at #AAAAI19 in San Francisco to share the latest food allergy treatment and research updates with you! I do not want to infringe on any of the presenters’ copyrights so I’m not sharing photos of any slides of posters. Instead, we will enjoy some selfies and photos with some of the wonderful people I met. What do we want from food immunotherapy? Dr. Burks told us that desensitization results in the increase of the threshold to a food allergen while on immunotherapy and may be sufficient to protect a patient from accidental ingestion. We also heard about sustained unresponsiveness, which is a lack of clinical reaction to food allergen after active therapy has been discontinued for a period of time. However, there is no set standard amount of time off therapy. In contrast, remission is a temporary state of non-responsiveness off therapy following immunotherapy. Dr. Burks also outlined some questions to discuss with patients and their family when considering the different food allergy treatment options. Have there been severe reactions to a food allergen? Are there fears about a patient eating their allergen(s) or having a severe reaction? Are there concerns about teens or young adults who are becoming increasingly independent and away from their families? Can the patient comply with the treatment’s daily regimen? Can the patient accept the potential side effects of the treatment vs. avoidance alone? Can they commit to the length of treatment and understand what happens if they discontinue? I hope that Dr. Burks’ talk about food allergy treatments inspires doctors to listen carefully to their patients and ask open ended questions to help match their patients’ medical needs to the most suitable immunotherapy that meets their personal circumstances. 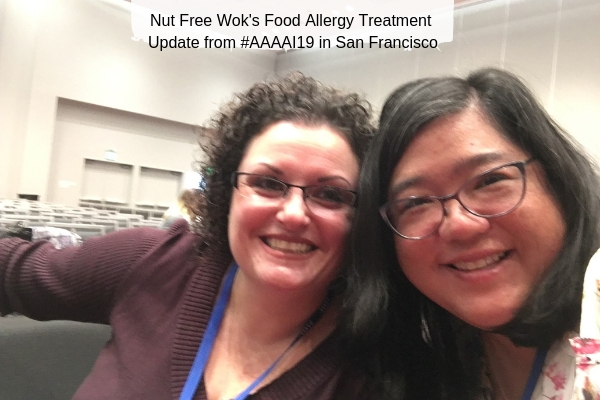 AAAAI19’s main theme was “Food Allergy: Advances in Prevention and Treatment.” Dr. Burks’ plenary session outlined the benefits and risks of each treatment as well as specific considerations for the patients and doctors. Dr. Robert Wood and Dr. Richard Wasserman debated about whether OIT is Essential for Food Allergy Management. Dr. Brian Vickery, Dr. Jacqueline Pongracic, and Dr. Edwin Kim spoke about Emerging Food Allergy Therapies. I also attended 2 press conferences which included OIT, SLIT, and some newer treatments. I decided to summarize by treatment rather than by session. What is it? – A patient eats a small amount of their allergens every day and increases the amount of their dose over time until they reach an amount that they take indefinitely. This treatment requires a doctor’s supervision. Patients must continue therapy in order to stay desensitized. Benefits – Many patients undergoing OIT have robust results in a relatively short amount of time. Risks – Some patients experience mild symptoms such as itchy mouth to severe symptoms such as anaphylaxis requiring epinephrine. Some patients to discontinue OIT due to recurrent abdominal pain. OIT also requires activity restrictions for a certain amount of time before and after dosing. This could be challenging for people with a busy or active lifestyle. Activity, illness, menstruation, and other co-factors might increase the risk of anaphylaxis. Some people might not like eating their allergens. Requires ongoing treatment. OIT is not a DIY treatment. 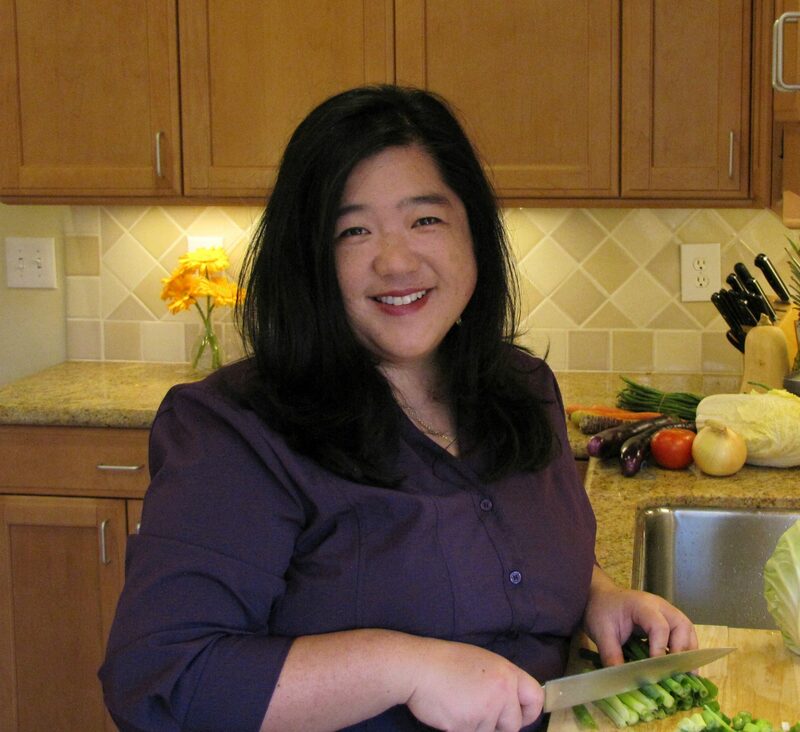 Dr. Vickery shared after the conference on Twitter some background information regarding why does the FDA consider food a drug when used for OIT. The thread is the cruicial to understand why OIT research is necessary. Another one of Dr. Vickery’s points about OIT is the need to study OIT for each allergen. We can’t assume that what we learn about OIT for one allergen will be true for another allergen. Dr. Woods told us that the protein content among different brands of peanut butter vary significantly even though the protein amount listed on the nutritional labels are the same. The protein content of roasted peanuts and milk also varied among different brands and the nutrition labels on grocery store food products are not adequate for the purpose of creating precisely measured OIT doses. Aimmune’s peanut OIT protocol is pending FDA approval. Aimmune creates capsules containing precisely measured peanut flour. 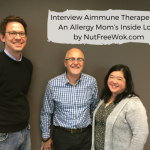 I interviewed Dr. Dilly and Dr. Vickery at Aimmune’s headquarters a few years ago and you can read about Aimmune’s latest clinical trial findings. Dr. Sampson, Professor O’Hehir, and Dr. Kim discuss their latest research news at a #AAAAI19 press conference. Dr. Kim shared during a press conference about a 5 year egg study in which patients went through an egg OIT protocol and then researchers followed up by phone for 4 years. The results showed the patients were compliant with the protocol, the protocol seems safe and promising, and continued regular exposure is necessary. All the patients had food challenges during egg OIT and those who were able to reach 10 grams of egg protein (approximately 1.6 egg) were assessed for sustained unresponsiveness (SU) after avoiding egg for 4-6 weeks. 22% were better than baseline and considered partially desensitized. Among those in the SU group, they could eat any form of egg (lightly cooked, baked, raw). They could eat egg everyday with unlimited ability, without any allergic symptoms, and no medications were needed. Among those in the desensitized and partially groups, their ability to eat different forms of egg varied. Some were able to tolerate lightly cooked, mostly were able to tolerate baked products, some experienced allergic symptoms. He also mentioned some caveats about their research. The patients in this study are very similar in demographics, it would be better to have study patients from varied backgrounds. They challenged only with regular egg and not with baked egg. It’s unknown whether some patients could have out grown their egg allergy naturally. It would useful to study the people who were not desensitized to see what could be learned from their biomarkers, characteristics, and starting IgE. Which is more effective, Egg OIT or Baked Egg OIT? Dr. Sampson shared the results of comparing Egg OIT with Baked Egg OIT on behalf of COFAR. 80% of children either outgrow egg allergies or become tolerant to baked egg products (baked with wheat for 25-30 minutes at 350F). Researchers wanted to know whether adding baked egg to their diets would accelerate outgrowing an egg allergy or could OIT be as fast as outgrowing an egg allergy? Egg OIT induces more rapid desensitization and sustained unresponsiveness in egg allergic baked egg tolerant children than the addition of daily baked egg product. Not only did the egg OIT group have better results, they also had fewer symptoms, a slightly higher rate of compliance, and an increase in IgG4 compared with the baked egg group. It’s important to note that even if the baked egg group can increase their egg tolerance, this increase in tolerance still allows them to improve their lifestyle. Egg OIT could accelerate egg tolerance but with mild to moderate reactions along the way. What is it? A patient places drops of a food allergen extract under their tongue for 1-2 minutes to activate the immune cells in the mouth and then swallow the extract. The initial doses are a fraction of 1 mg of peanut protein and gradually increase to 1-4 mg of peanuts depending on the protocol. The FDA has approved SLIT to treat some environmental allergies but not for food allergies. SLIT for food allergies is promising as a food allergy treatment because the immunomodulation results of SLIT for food are similar to SLIT for environmental allergens, which is FDA approved. Benefits – SLIT offers good results over time with few adverse events. Some patients experience minor symptoms such as mouth itchiness which improve with ice chips and other simple remedies. Risks – Patients experience minor side effect symptoms, such as mouth itchiness, which resolve on their own or with simple remedies. Requires on-going treatment to maintain tolerance. More research is needed to determine the right dose and right duration of treatment so that patients experience better results, fewer symptoms, and ease of use so that there is greater compliance and fewer patients who discontinue treatment. More research on biomarkers of those who are able to achieve sustained unresponsiveness to help predict which patients would be most successful with SLIT. My son and I spent many peanut patch appointments with Tina Dominguez, PA and we had so much fun. I love this lady, super smart, fun, and kind. What is it? – Epicutaneous Immunotherapy refers to DBV’s Viaskin products for peanut allergy and milk allergy, which are currently in phase 3 clinical trials. 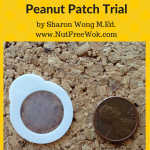 The patch is a small plastic disk with a small amount of allergen electrostatically sprayed on it with a thin foam ring to create a condensation chamber. A new patch is applied on healthy intact skin daily and a patient’s sweat solubilizes the allergen, which is absorbed into the skin to activate the skin’s immune system. Benefits – The main objective is to help patients to have an increase tolerance in case of an accidental ingestion of their allergen. EPIT is easy to use, one can change the patch daily without having any activity restrictions or precautions. Risks – common symptoms are mild to moderate skin reactions which typically improve over time. Limited information on what would be a treatment endpoint and what to do to stay desensitized. significant difference in results between the placebo group and treatment group. Studies include toddlers and children currently, still waiting for research for teens and adults to resume. Latest phase 3 clinical trial results were published by DBV during AAAAI19. 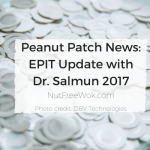 Obviously my son’s experience in a peanut patch trial or my interviews with Dr. Benhamou and Dr. Salmun weren’t shared or discussed during AAAAI19 but they might offer good background information for those unfamiliar with EPIT. Lori and I were happy to run into Eleanor Garrow-Holding, CEO of FAACT at AAAAI19! I was so excited I unknowningly took a blurry selfie which I tried to fix with a filter <3 (100% disclosure, LOL). PVX108 is a peanut allergy injection developed by Aravax, based in Australia. The injection contains peanut allergen derived peptide segments “which precisely target the peanut specific T cells that are believed to be the underlying cause of” peanut allergy. 66 adult trial participants received a mixture of peptide segments of peanuts injected into their forearm. This form of treatment has a high safety profile, with no side effects including anphylaxis, because it builds tolerance with peanut peptide segments rather than desensitize with whole peanut extracts. Part 1 of their phase 1 study included testing for the safety of the doses. In part 2 of their study, patients received six injections over a 16-week period. Overall benefits include a high safety profile, does not need dose increases, monthly shots are convenient compared to daily dosing or weekly office visits. Phase 2 will include children. Their goal is to treat any patient, any age, and any severity. BOPI is peanut allergy desensitization using boiled peanuts for OIT. Apparently boiled peanuts are less allergenic and causes less GI distress compared to roasted peanuts. It might be one way to desensitize peanut allergic patients with fewer GI symptoms and then patients transition to roasted peanuts when the patients are more tolerant. The researchers were vague about the BOPI protocol because they don’t want people to try this at home without further research and medical supervision. In very general terms, patients visit the clinic to eat some boiled peanuts under supervision and then they are given instructions on how to prepare their boiled peanut dose. Over time they will decrease the cooking time and increase the amount of boiled peanuts consumed until they are ready to transition to roasted peanuts for convenience. Some patients dropped out, some patients experienced anaphylaxis, approximately half of the patients were desensitized and half of those patients demonstrated sustained unresponsiveness. There were low rate of GI distress according to the press release. We will learn more about this food allergy treatment from pending phase 2 research. Members of Food Allergy Treatment Talk (FATT) Facebook group had an IRL meetup. Stacey Sturner’s group is a perfect example of a community that supports food allergy research. Pictured (L-R): Dr. Eric Yang, Nina Aggarwal, Jennifer Chung, Barrie Sharpiro, Allison Anderson, Debbie Taback, Whitney Block NP, Dr. Brian Schroer, Alicia Bales, Dr. Stacey Silvers. me. Photo credit: waiter at Wine Down who hilariously took a selfie on my phone. 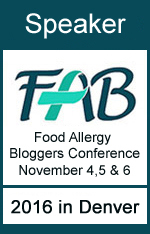 How can the food allergy community support and help advance food allergy treatment research? 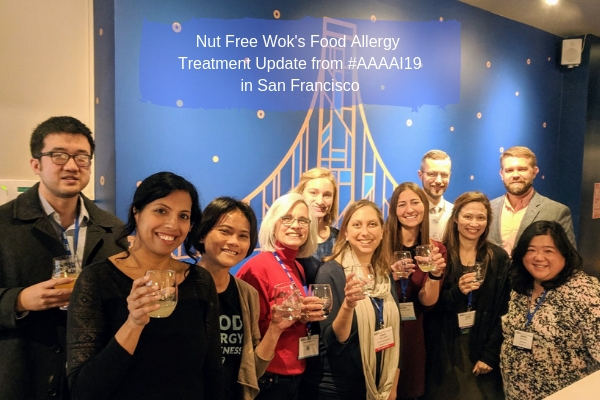 After hearing about so much research on food allergy treatment options, I felt very moved and grateful for the professional dedication of all the allergists and researchers working to help us, our children and grandchildren, and future generations. I love that they’re thinking about what we need and want and encourage shared decision making. 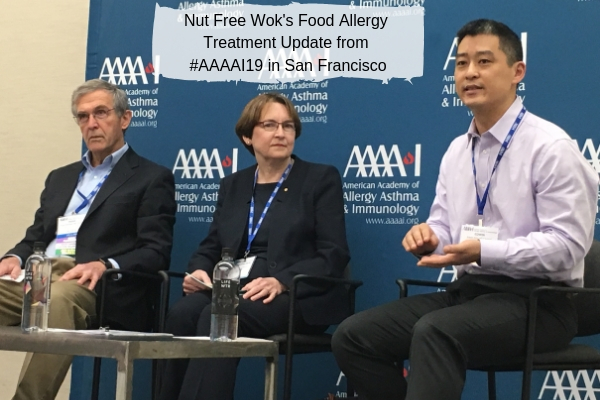 During a press conference with Dr. Sampson, Professor O’Hehir, and Dr. Kim, I was absorbing all of the information during the Q&A and then I wondered about what else can we do to help advance food allergy treatment research as we’re waiting for optimal food allergy treatments? I felt slightly terrified to ask an off-topic question because I didn’t want to embarrass myself or anyone with a rookie move. I’m so glad I asked because the doctors’ responses were gracious and informative. Unfortunately I accidentally stopped my audio recording (SMH life happens!!!) so I can’t accurately attribute who said what. I just have my notes to summarize their key points on what we can do as a community. 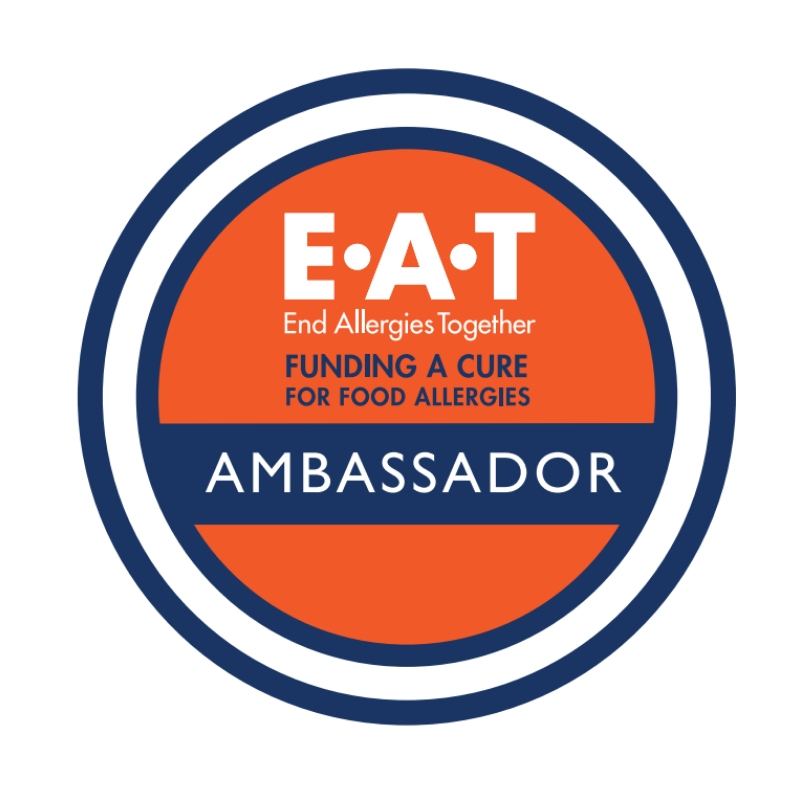 The doctors did not mention specifically how to fund research but as one of End Allergies Together‘s Mission Ambassadors, I recommend donating to EAT because 100% of the donations they receive fund research. Another option is to donate to a COFAR site, Stanford’s Sean N. Parker Center for Allergy & Asthma Research, or other university affiliated food allergy research site. Participate in food allergy clinical trials. Share what we currently know about food allergies and research to counter misinformation. Include more information and data about minority, rural, and inner city populations are needed, we need to engage people in these under-represented communities. I also reached out to Dr. Burks for his thoughts on how we can support food allergy research and even though he wasn’t at the press conference, he was so kind to contribute. Every affected family should advocate for increased federal funding for food allergy research with their Congressional representatives. It is important that they hear from their constituents, and nothing is more powerful than personal testimony. Earlier today I tweeted about efforts that AAAAI is making to recruit physicians to do this on behalf of patients, but patients and families themselves are actually more likely to create bigger impact. Thank you Dr. Burks, Dr. Kim, and Dr. Vickery! Friends, I hope that some of the points that the doctors shared will inspire you to find ways to participate in food allergy research. As you can see, there are many ways to get involved. Dr. Ruchi Gupta shares her latest research on sesame allergy in the US during a AAAAI oress conference. Dr. Ruchi Gupta presented “Epidemiology of Sesame Allergy in the United States” during the conference. Based on her research we now know that approximately 1.1 million people are allergic to sesame, which is close to the number of people who are allergic to soy and pistachio. These results are timely and critical since the FDA is considering whether to mandate allergen labeling for sesame as a 9th top allergen. It’s very compelling to label sesame as a top allergen because the rate of sesame allergy is higher than some tree nuts such as pine nuts or macadamia, which are currently regulated as tree nuts. 80% of people with a sesame allergy have multiple food allergies, 50% of them are allergic to peanuts and tree nuts. 20% are allergic to sesame only. The overlap of peanut/tree nut and sesame allergies are not due to cross reactivity. Some people might have the tendency to react to similarly shaped allergens. Sesame allergies are serious. 2/3 of people with a sesame allergy have had a severe reaction at some point, 1/3 of people with sesame allergy report going to ED within the last year. I was intrigued to learn that exercise and sleep deprivation increase the risk of an allergic reaction for someone with a peanut allergy. Research subjects underwent three randomized peanut oral food challenges. One of challenge required the patients to exercise after each peanut dose. One of challenge required the patients to arrive sleep deprived. And one of the challenges has no interventions. In my non-medical professional and personal opinion, this connection between sleep, exercise and tolerance levels could be informative for food allergy treatment best practices, oral food challenges, and improving the outcomes of general avoidance strategies. There are so many things out of our control but we can try to improve the quality of our sleep and the timing of exercise. These are some areas for further consideration with our medical care team. I attended a session by Jodi Shroba from Children’s Mercy Kansas City. Bullying is when someone causes intentional harm on another person. Food allergy bullying activity such as exposing someone to their allergen can lead to fatal consequences, in which case bullying can be considered a criminal act. We see food allergy bullying portrayed in films, TV shows, and memes which are alarming because they normalize negative behavior regarding food allergies. 80% of bullying at school are by classmates. Bullying can be non-physical such as teasing, ignoring or excluding, spreading rumors in person or on social media. Bullying can also be physical such as unwanted or harmful contact, contamination of personal belongings or food with allergens, or waving allergens to tease or threaten someone. Bullying affects children their emotions and their quality of life negatively. It is important to recognize signs of bullying, such as reluctance to participate in activities or to attend school. Unexplained headaches or bellyaches are common symptoms. Sometimes the student doesn’t want to ride their school bus. The student shows signs of depression, changes in grades, or unexplained injuries. The need to fit in with peers can increase risky behavior among teens and young adults. Bullying can affect their willingness to carry epinephrine and to avoid eating risky foods. It is helpful to educating friends to support the student’s food allergy concerns. I was only able to stay for a portion of this session about food allergy bullying in schools. I also attended a session on the psychosocial concerns about food allergies and food allergy bullying is one indicator that a child might benefit from a referral to a therapist to help them. My friend Lori Lee Newton attended the conference for two days with me to help me cover a portion of the conference. She’s such a joy with her big smile and bubbly personality and it was fun to compare notes and debrief together in during the conference. 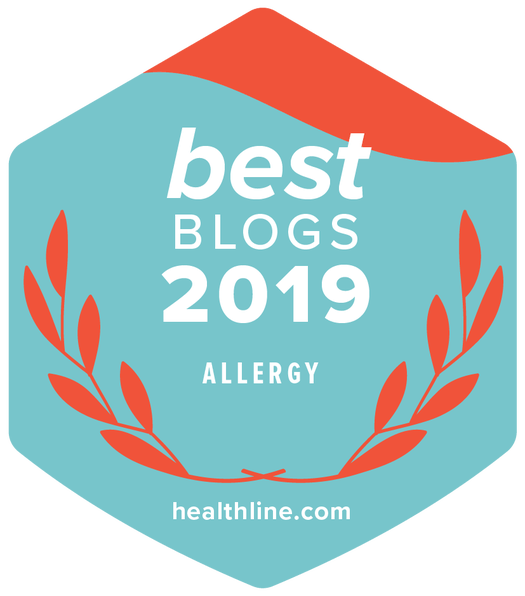 You can read our post about the psychosocial concerns of food allergies and Dr. Robert Woods’ plenary message about food allergy testing. Thank you so much for this write-up! It is very informative and exciting to see what treatment options are being considered. My 13 year old allergic kiddo appreciated reading it too. Thanks again! You’re welcome! I love that your 13 year old liked reading it too! So informative! Thank you for compiling this information! Do you have a form letter we can send to our Congressional representatives to advocate for research? Thanks! Hi Allison, all the information on how to send letters of support are outlined in this article from AAAAI. Find your senators and rep, copy, paste, and edit the sample letter and email or call them. Thank you for the reminder, I just sent mine tonight.